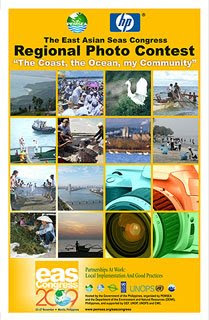 "The Coast, the Ocean, my Community" Photo Contest ~ Philippine Freebies, Promos, Contests and MORE! Another photo contest for photographers out there. HP and East Asian Seas is hosting "The Coast, the Ocean, my Community" Photo Contest and is split into 3 categories: youth, amateur/hobbyist, and professional. Top pictures for each category will each get an HP F4185 printers and complimentary registration to attend 2009 EAS congress. "The photo contest will emphasize the importance of turning knowledge and concern about the coastal and marine environment into on-the-ground actions. It aims to generate awareness on local and national ocean-, coastal-, and environment-related initiatives of each country and to increase participation of the communities in these activities." Hello, dropping by here. In case you are interested about the 2008 Beijing Olympic Results, check out 2008 Beijing Olympics Medal Tally Count for updates on Olympics medals.